Research shows that your morning mindset sets the tone for your entire day. Wake up inspired to live the life of your dreams with My Wake UP Call® Motivational Alarm Clock® 10 iPhone Apps – with patented, daily 5-minute motivating messages instead of a blaring buzzer or negative news. Each of My Wake UP Call® 10 iPhone apps includes 7 inspiring 5-minute messages with famous experts and thought leaders who help you to create the life of your dreams, first thing in the morning, when it matters the most. Choose to wake up and workout, lose weight for life, relieve stress, wake up set for success, find love, financial freedom, and so much more! Start your day with this automated success tool, or listen any time you need a boost. All of our 17 product lines with our 100 hours of motivating messages are also available as in-app purchases, or MP3s the @iTunes store. My Wake UP Call is featured in SHAPE, SELF, Oxygen, Woman's World, USA Today & NBC. Process Patent 8,064,295. 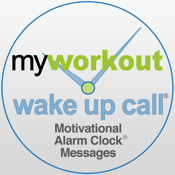 My Wake UP Call® and Motivational Alarm Clock® are 2 of 8 Registered Trademarks for My Wake UP Call products owned by My Successables™, Inc ©2013 My Successables, Inc. All messages and message structures are copy written. All rights reserved.